Many people make strength training a lot more complicated than it really is. I get phone calls all the time from people who say they want advice but just end up sucking the energy out of me because they can’t grasp the simplicity of training. They don’t realize that regardless of what mode or method you use, the foundation remains the same. Many people are looking for a magic formula of success, not advice. They panic when they can’t get the exact number of reps in the bench press that the training cycle they are following says they should (cycles are a rough guide, but no guarantee of training success). They get hung up on minor details and want to “label” the type of training that I do, or think is “the best.” They don’t realize that there are many ways to train hard and productively. You don’t have to train using just one of them. Strength training is at least as much art as it is science. Only you know what works best for you. Keep good training notes. Log every workout in detail. Learn from your training. Keep your training simple, because strength training is simple. Don’t let academic types confuse you (many of them enjoy doing this). Remember the foundation—train the whole body hard with an equal emphasis on pushing and pulling, with progression as the top priority. Many modes and methods can be used to do this. Focus on the basic multi-joint movements, eat right, and get plenty of rest. That’s it! Shake the dust off of your copy of Brawn, and reread the book. “Hard,” “safe” and “productive” are the only labels that are needed to describe your training. Even though you should train brutally hard, you should enjoy it! Stuart described this well in Brawn as “the joy of effort.” It’s all a matter of thinking. If you learn to enjoy training hard, you are more likely to be consistent. You will not stick with something that is viewed as drudgery. Enjoy training! One of the best ways to enjoy training is to “mix things up.” This will renew the enthusiasm of both your mind and body, as well as produce more balanced conditioning. I have spent a good deal of my training time doing low reps and singles, but I also do 20-rep squats, 50s days, and high reps. I’ve used multiple sets for many years byt am currently getting good results using only one set to failure for each exercise. I’ve used both free weights and machines, and have even experimented with various speeds of motion. The point is that many modes and methods work, but it’s how you use them that counts. Don’t waste energy arguing about which one is “best” because there is no point. Try the different modes and methods yourself. Every three or four months, change your routine. Make some big changes. Do 20-rep squats for four months, then do 10-rep squats for a while. Four months later, go down to 5 reps. I couldn’t imagine doing 20-rep squats all the time! 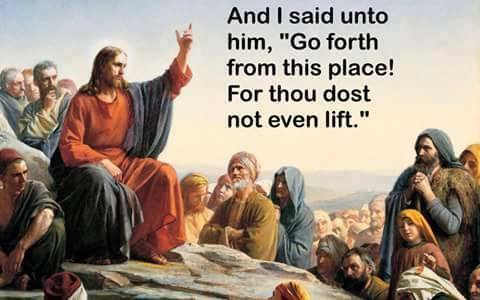 And I couldn’t imagine doing low reps all the time either. After about every four months my joints want a change. Train with no rest between sets while doing a brief workout of no more than 30 minutes. Four months later, give yourself some rest between sets and see how heavy you can go! Use your imagination and go with your instincts. Listen to what your body is telling you—only you know how you feel. 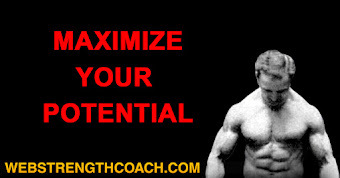 Make the changes needed to keep your enthusiasm high so you can really attack the equipment when you train. Don’t get hung up on labels as this only limits the tools you have available for building your body. Around the 15th of the month, for a change of pace, I’ll put my clients through one workout of extremely slow movements. I’m not an advocate of training this way all of the time, but have nothing against anyone who does, as it works for sure. Every two weeks my clients get hammered with something radically different. It keeps their body shocked and off guard, and morale and motivation high. For the past two months I’ve been training Melvin Tuten. Melvin is a huge man, 6-7 and 335 lbs. He is an offensive tackle for the NFL Cincinnati Bengals. Because of the severe flooding in the Cincinnati area, he has stayed home (in Washington, D.C.) during the off-season and has been training with me. On a recent 50s day Melvin got 540 lbs for 50 on the Hammer Iso-Lateral Leg Press, with a dead stop pause on each rep! He is now doing mainly a moderate to low-rep high-intensity program. 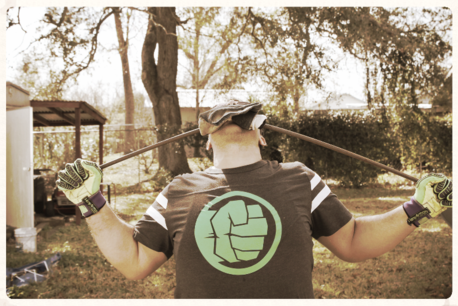 But we mix it up and throw in 20 reps on the Tru-Squat sometimes, along with a 50s day, a slow day, sandbag, etc. Manage your own progression system. I have always believed in progression by performance, not time. All my clients have to earn a poundage increase on the basis of the performance of their previous workouts. I have never believed that you can forecast increases according to a schedule. If you get stuck on a particular poundage, you must learn to be your own sports psychologist and play games with your head. I frequently lie to my clients and don’t tell them the weight on the machine or bar, even if they ask. I sometimes tell them that I took off weight when I really added weight. They don’t know what to expect, so they can’t worry about not getting a certain poundage. As a result they just focus on pushing or pulling as hard as they can. Anyone who has had success in strength training ahs had to master their mind. If you train alone, this is more difficult, but this is a challenge you should enjoy and must master if you are to maximize your potential. If, for example, you get stuck with 245 x 5, 5, 4 and can’t seem to get the 5, 5, 5 that you want, change the goal for a while. Try a week or two with sets of 4 at 255, try a triple with 265, or a double with 275. Go to failure with 215, or do just 2 sets of 5 and get rid of the third set! If you keep good notes you can make the proper changes to avoid a mental rut, and have new goals on an almost daily basis. You are your own coach and must find ways to keep your mind positive and fresh. Then go back to 245 after a few weeks, but with a new outlook. A barbell, Hammer machine, Tru-Squat machine, or dumbbell will not produce good results unless the person using the tool is willing to put forth the consistent effort required. If anyone tries to tell you that they have the “only way to train,” or even “the best way to train,” don’t listen. If they say it is the best way for them to train, that’s different. But if they use a blanket statement and say they know the best way for everyone to train, they are ignorant. Many times they have something to sell you. They may want you to go along with their “program,” buy a book, or pay for a certification program, etc. Mike Thompson and Drew Israel train very differently if you look at modes and methods. But so what? Both their approaches work. If, however, you look at the basic core foundation, they are similar and sound. Neither is better than the other. Through trial and error, and by listening to their own bodies, both men have found what they enjoy and what works for them. You should do the same. There is very little enjoyment in merely looking on at life; there is much more thrill and excitement in being one of the players. How many times have you watched the stout, lazy-appearing fellow, trying to interest himself in an athletic event or in some demonstration of athletics going on in front of him? And how often have you observed the weak, thin individual doing the same? The fat one has amusement in his eyes, for the antics and quick movements of the youths before him interest and cheer him. The thin one will have a different expression. His will be one of admiration and envy combined; his longing to duplicate the movements of the performers before him is much keener than that of his stout friend. But both of them would be much better off by participating in some form of activity than by idly sitting and watching, either eagerly or amusedly. The longer the fat man sits the lazier and stouter he becomes, and the longer the thin man waits the weaker he becomes. Inactivity is a forerunner and a cause of decay. If you strapped your arm to your side for thirty days you would be astounded at the difference in size between the arm that was strapped and the free arm. I dare say the strapped arm would lose several inches in girth and any bit of muscle and strength that it had possessed would be practically gone at the expiration of that time. As long as physical activity is essential, I cannot understand how anyone would purposely neglect his body and allow it to accumulate fatty tissue or, should he not be inclined to take on weight, become thinner and weaker and more sickly. What enjoyment can such types of youths and men really get out of life? There is more to life than working, eating and sleeping. Life should be considered a privilege, and not an obligation. To the one who is overburdened with weight and whose internal organs are sluggish, it is an effort to move about; consequently he rests considerably more than does the thin, fidgety, nervous individual. The stout man puffs from the least exertion, and were he to run the short distance of one hundred feet he might experience heart pains, not to mention breathlessness and fatigue. It is an effort for him to climb stairs. If he but realized, he would feel vastly different if he adopted physical culture, he would have much more vitality, and he would have much less desire to sit around and do little or nothing. He most certainly would take more pleasure in his experiences than from any artificial thrills that money can buy. Outside of being able to float on the water, the fat man is practically helpless when it comes to saving his own life. He cannot run, he cannot jump, he cannot climb; and in addition, when ordinary physical exertion is required he needs help. The thin man possesses more irritability of muscle than the stout one and, naturally, is more inclined towards activity. Even though his body may be weak, his mind is willing. However, the thin man is more inclined to follow endurance work; and, therefore, as long as endurance movements are natural with him he should stick to that until he has obtained the vitality energy and health that will give him the ambition to adopt heavier training methods. The stout man, of course, must first of all exercise to reduce the superfluous flesh covering his muscles, for with too much fatty tissue he cannot expect ever to have any amount of endurance. His ambitions may not be as high as those of the thin, sickly man who has awakened to the value of health and strength in all their phases; but every stout man surely longs to be rid of some of his fat with as much longing as his sluggish desires permit. If formerly he had possessed sufficient ambition and energy he never would have become fat; he never would have allowed the belt to become gradually tighter around his waist. But physical laziness creeps upon one very insidiously. A few minutes of bending and twisting movements soon will reduce his waistline, much more rapidly than he may imagine; and as he goes further into physical culture methods, he will find himself gradually becoming more interested in strength work than in endurance work. This progression is natural, because the less flesh one has on one’s bones (within reason) the more rapid of movement one becomes, while fat people are slow-moving individuals and are apt to take to slow motion (strength) exercise. 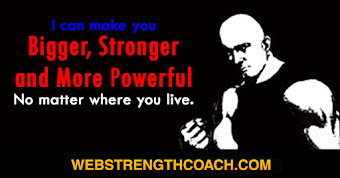 After reducing his waist the fat man should interest himself in strength-building exercise until he has enough strength and development to be able to handle his body with east. At that time it will be quite natural for him to interest himself in endurance movements. Although a stout man may be possessed of much patience, he would find himself becoming very impatient if he were compelled to undergo endurance work at first. Of course, there are exceptions to this general tendency. I am basing my statement upon personal observations and experience with thousands of individuals during my lifetime of teaching. In these ways the thin man and the stout man can eventually obtain the muscular activity both in strength and endurance to be fully capable of protecting themselves in emergencies. If you are fairly well developed and athletically inclined, perhaps what I am writing may not especially interest you; but let it be a warning to you always to keep in condition. But if by chance you are a reader to whom these words “hit home,” why not now, before you lay this book aside, resolve to take up physical culture in all its branches? The size and shape of the muscles often indicate their quality, though there are exceptions to this. I believe that muscles which are trained down to a fine point never will possess the endurance qualities of muscles that are covered by a slight fatty tissue. In the first place, a muscle that is used excessively is continually tearing down tissue; and if the muscle consists of nothing but muscle fibre continual movement will be forced action, drawing heavily upon the nervous energy. If there is a little fatty tissue covering the muscle, this tissue will be burned up first before the muscle is forced to act solely by nervous energy. 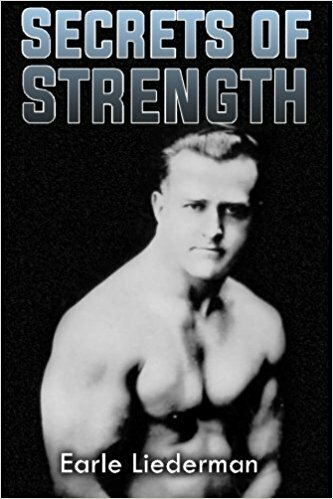 I do not mean that an arm, for example, necessarily must be fat in appearance in order to possess endurance qualities, for anyone who has seen photographs of George Hackenschmidt, the former world’s champion wrestler, knows what huge, knotty muscles this famous athlete possessed; and yet he had remarkable endurance powers. 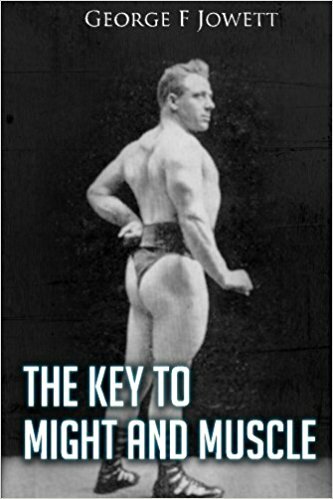 His muscles, however, were not cordy or trained down to the degree of those of Eugen Sandow. Sandow undoubtedly possessed the most symmetrically developed body and the finest muscle contour of any athlete, either in this or recent past generations. 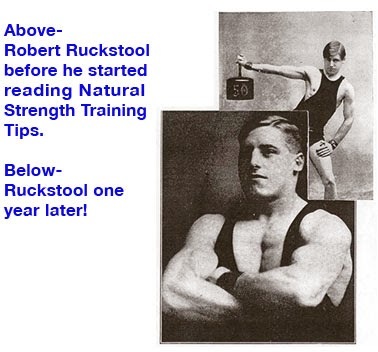 Yet it is not on record that Sandow accomplished anything in the way of endurance; his muscles were remarkable for immediate action and lifting of enormous weights. But I doubt very much if Sandow in his heyday possessed half the endurance of most of our present day boxers, runners, or swimmers. Sandow must have performed an untold amount of work and exertedtremendous effort in order to attain the physical perfection he possessed; but he probably never did any endurance movements to any appreciable extent. 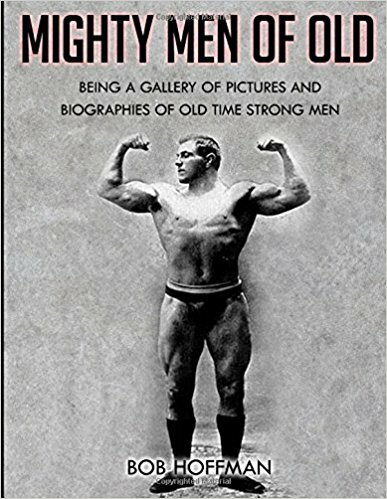 Hackenschmidt, on the other hand, brought heavy dumb-bell exercise into his training program; but he also was a wrestler and often wrestled for hours at a time, and it was these long periods of wrestling that gave him the huge and powerful muscles, wind and endurance that he possessed. 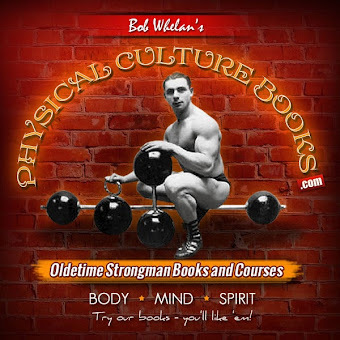 I have been many marvelously developed athletes whose muscles stood out in huge knobs all over their bodies and who were very pleasing to look at, but I could tell at a glance that their muscles were incapable of performing endurance work. It may be of interest to relate a personal experience, showing how the muscles undergo a change from time to time. About ten years ago my upper arm measured relaxed thirteen and a half inches, and when flexed sixteen and a half inches. This difference of three inches was brought on by the contractile power I had in my biceps and triceps. I had developed my arms by progressive exercising, such as I am teaching today to my students who are desirous of becoming strong and muscular. Upon becoming interested in endurance work I found, after adding endurance movements to my daily exercising period and combining them with my muscle- and strength-building exercise, that after a few years my upper arm still remained the same when flexed, sixteen and a half inches, but when relaxed it measured fourteen and a half inches, showing a gain of one inch in tissue and losing one inch in contractile expansion of flexion. The contour of the muscles remained practically the same when flexed, but when relaxed my arms now appeared considerably thicker than they did in the years before I became interested in endurance movements. Perhaps you may become somewhat discouraged by my experience and the fact that, though I have continued to exercise for so many years, my arm has remained the same in size. So let me call your attention to the fact that I am no longer a “kid,” and my desires to become as large as possible are over. Now I am exercising daily merely to keep in condition and to retain the development that I built up through my previous progressive efforts. I no longer perform progressive work to any marked degree, so far as muscle-building and strength exercises are concerned; for I am firm in my belief that, as I have elsewhere related, to continue progressive work year after year as one nears middle life is unwise and may bring on disastrous results. When once you have developed your body, a little light activity will keep it in shape. The only thing you can progress in, then, is endurance; and endurance movements, if not carried too far, will prove of great benefit not only to the muscular system but to your internal organs as well. When you are doing anything calling for endurance your heart and other organs will tell you when to stop, and the only time you should continue endurance movements beyond this point is when you are in competition and some destination or goal compels you to continue. But unless you are thoroughly prepared to withstand such attacks upon your body, you will find that disastrous results will follow. For example, it would be foolhardy for you to enter a marathon race if you never have run more than a mile or two before. It would be equally foolhardy for you to attempt to swim for a mile if the farthest distance you have heretofore made was half a mile. A boxer never would attempt to fight twenty rounds if on numerous occasions during his preparatory training for the contest he had not been able to box much more than twenty rounds. Only the other day I entered a pool for a swim. I decided that I would swim a mile. Now many times before I had made this distance, but on this particular day the air was chilly, my muscles were cold, and my stomach was empty, and the thought of the next meal was a pleasant one. However, I dived into the water with full intentions of making the distance, fifty-three laps to the mile. Lap after lap I crawled through the water, but at about the thirty-fifth lap I felt as though I had had enough. Some inward physical warning told me not to continue. I could feel the first dull pull at my heart--that feeling that is experienced by anyone performing endurance work. Immediately I came out of the water. I believe that had I gone the other eighteen laps and completed the mile swim, I might have overtaxed my heart, perhaps not dangerously but enough temporarily to interfere with its rhythmic beat and action; and every physician will tell you that continued forced muscular exertion, stimulating heart action and producing strain, eventually will cause dilatation and perhaps permanent enlargement or valvular leakage. So, if ever you are performing exercises of endurance you should always be guided by the feeling of your organs, just as you are guided by the feeling in your stomach when it is calling for food, or the dryness of your mouth when you crave water. If you go against the laws of nature you will bring trouble upon yourself. Therefore, in all endurance exercises be sure to progress in moderation.